Rob is an associate in Koskie Minsky’s Class Action Group. 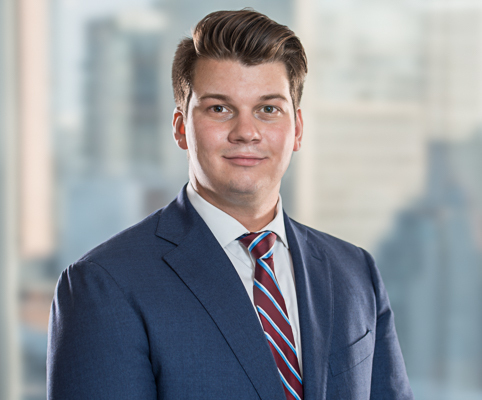 Rob joined the Class Action Group in 2018, after completing his articling rotation in civil litigation and class actions at the firm. Rob completed his J.D. at Western Law, where he engaged in a variety of advocacy-focused endeavours. He was on the Western Law Advocacy Committee, winner of the 2015 Ontario Trial Lawyers Association Moot, winner of the Borden Ladner Gervais Labour Law Moot, winner of the Lenczner Slaght Legal Ethics and Professional Moot, and recipient of the Major-General Henry Smith Award for Advocacy for his performance during the Philip C. Jessup International Moot Court Competition. In addition to mooting, Rob served as a student ambassador to prospective students on behalf of Western Law. Prior attending law school, Rob studied business and legal studies at University of Waterloo.